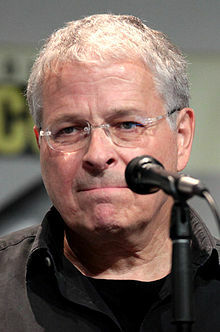 Lawrence Edward Kasdan (born January 14, 1949) is an American screenwriter, director and producer. He is best known as co-writer of the films The Empire Strikes Back, Raiders of the Lost Ark, Return of the Jedi, Star Wars: The Force Awakens, and Solo: A Star Wars Story. Kasdan at the 2015 San Diego Comic-Con International. He has been nominated for three Oscars: twice for Best Original Screenplay for The Big Chill and Grand Canyon and once for Best Adapted Screenplay for The Accidental Tourist. He is the father of directors Jake Kasdan and Jonathan Kasdan, and the father-in-law of musician Inara George. Kasdan was born Jewish in Miami, Florida, the son of Sylvia Sarah (née Landau), an employment counselor, and Clarence Norman Kasdan, who managed retail electronics stores. His brother is the writer/producer Mark Kasdan. He was raised in Morgantown, West Virginia, where he graduated from Morgantown High School in 1966. He graduated from the University of Michigan with an MA in Education, originally planning on a career as an English teacher. He lived at the Eugene V. Debs Cooperative House for a time while in Ann Arbor. Kasdan won a Hopwood Award for writing during the time of his studies. He was a student of Professor Kenneth Thorpe Rowe. Upon graduation, Kasdan was unable to find a teaching position, so he became an advertising copywriter, a profession he did not enjoy, but remained in for five years, earning a Clio Award for his work. Kasdan began his career in Detroit, later relocating to Los Angeles where he began to write screenplays. Kasdan's introduction into the film business came in the mid-1970s when, after being rejected 67 times, his script for The Bodyguard was sold to Warner Bros. as a vehicle for Diana Ross and Steve McQueen. The script became stuck in "development hell" and became one of several screenplays successively called "the best un-made script in Hollywood"; it was eventually produced as a 1992 film starring Whitney Houston and Kevin Costner. After he sold his screenplay Continental Divide to Steven Spielberg, George Lucas commissioned Kasdan to write the screenplay for Raiders of the Lost Ark. Lucas then hired Kasdan to complete the screenplay for his Star Wars sequel The Empire Strikes Back (1980) after the death of Leigh Brackett, who wrote the first draft. Kasdan made his directing debut with Body Heat (1981), which he also wrote. Lucas later commissioned Kasdan to write the screenplay for Return of the Jedi (1983). Kasdan is known for both writing and directing his films, which have ranged from Westerns and romantic comedies to thought-provoking dramas. He has received four Academy Award nominations, for screenplays to The Big Chill, Grand Canyon, and The Accidental Tourist, for which he also earned a nomination for Best Picture. Grand Canyon won the Golden Bear at the 42nd Berlin International Film Festival. From 1994 to 2003, he made a set of films that, in contrast to the hits he had in the 1980s, failed to break the bank in receipts; among these films were Wyatt Earp and Dreamcatcher, the latter based on the Stephen King best seller. The exception was 1995's French Kiss, which grossed $100 million. He made cameo appearances as the lawyer of River Phoenix's character in I Love You to Death, the director of Steve Martin's character's latest action film in Grand Canyon, and in James L. Brooks' comedy As Good as It Gets as the fed-up psychiatrist of Jack Nicholson's novelist. In 2001, Kasdan was the recipient of the Austin Film Festival's Distinguished Screenwriter Award. In 2006, Kasdan received the Laurel Award for Screenwriting Achievement from the Writers Guild of America. Kasdan directed the 2012 dramedy Darling Companion, starring Diane Keaton and Kevin Kline. In October 2013, it was announced that J. J. Abrams had taken over screenwriting duties for Star Wars Episode VII (Star Wars: The Force Awakens), working alongside Kasdan, following the departure of Michael Arndt. After his involvement with Solo: A Star Wars Story, he left the Star Wars universe, and has no involvement in The Last Jedi or The Rise of Skywalker. On May 22, 2016, Kasdan was honored by the Atlanta Jewish Film Festival and ArtsATL.org as the inaugural recipient of their "ICON Award for Contributions to the Cinematic Arts" in a ceremony held at the Woodruff Arts Center. ^ Lawrence Kasdan Biography (1949–). Filmreference.com. Retrieved on February 26, 2016. ^ "Lawrence Kasdan Trivia". Lawrence Kasdan. Retrieved January 9, 2010. ^ "The Big Chill (1983)" – via www.imdb.com. ^ "Hopwood Program" Archived December 27, 2010, at the Wayback Machine. University of Michigan. Retrieved February 12, 2013. ^ "Berlinale: 1992 Prize Winners". berlinale.de. Retrieved May 24, 2011. ^ "JJ Abrams to script as well as direct". Guardian UK. August 25, 2013. Retrieved October 25, 2013. ^ "Han Solo's 2018 Spotlight Will Be Lawrence Kasdan's Last 'Star Wars' Movie (Report)". www.hollywoodreporter.com. Retrieved November 12, 2015. ^ "What is the AJFF Icon Award?". www.artsATL.org. March 25, 2016. Retrieved May 22, 2016. Wikimedia Commons has media related to Lawrence Kasdan.